What should you do with the newspaper you’ve just read? Recycle it, of course — but recycling doesn’t always mean tossing it into a bin so it can be reincarnated. Before you send the funny pages — and every other section — to that big paper pile in the sky, consider using it for something else, like wrapping gifts, washing windows, preventing garden weeds, making origami sculptures, and so much more. This seems totally counterintuitive, but a friend of mine recently told me that using newspaper to clean windows works better than a cloth in preventing streaks. Weird, right? Wouldn’t all that newsprint transfer to the glass? It certainly does on my hands. It seems, however, that the newspaper-window-washing Internet population agrees with my friend. For even better results, use a vinegar-and-water solution instead of a chemical cleaner like Windex. This wouldn’t work in my house since fruits tend to go bad before we eat them (we’re carb-aholics), but if you want to speed up the ripening process, simply wrap individual pieces in newspaper so you can eat them sooner. Don’t take any chances when using stain-prone products like paint or shoe polish. Put the paper down before you start your project to protect your goods. You’ll totally hate yourself when you make a mess that could have been prevented. Another tip from a friend that I had never heard of — if you have a garden and weeds are a problem, cover the bed with newspaper and water it to the saturation point. Once that’s done, cover the paper with organic matter, like compost or mulch. Eventually, the newspaper will smother the problematic weeds, and the organic matter will help your garden flourish. If you have a paper from a notable date in history, i.e. the election of President Obama, etc., put it up for sale. You’ll be surprised how many people collect historical editions of print publications and how much they’ll pay for it. You’ll get the highest bid when you list the paper while there’s still demand for it, but don’t discount its popularity many years down the road. One person’s trash is another person’s treasure. Hasn’t Hoarders taught you anything? We know what paper mache is, but do your kids? It seems like this craft activity, which uses newspaper, glue, flour, and water, is becoming a dying art. That’s a shame, because it’s so easy and fun! The sky really is the limit with paper mache, too; whatever you can think of, you can make. Like these paper-mache masks. Great for Halloween! I made one of these many years ago, and the final product still hangs on the wall in my home. It couldn’t have been simpler. I saved the front pages of my favorite sections of USA Today over the course of a few weeks (you can use whatever newspaper you’d like; I just preferred the colors of USA Today), bought a 4-foot-by-2-foot canvas, arranged and lightly glued the sections on the canvas, then brushed on several coats of Modge Podge. Easy as that. The newsprint didn’t budge — and now I have a perfectly preserved time capsule/art piece to admire for years to come. Picture frames with pictures make excellent gifts — even more so if the picture frame is a handmade. To create a picture frame out of newspaper, all you’ll need to two sheets of paper (or the front and back pages of the newspaper), scissors, a ruler, tape, clear plastic from packaging, your favorite photo, and these 10-step frame instructions. Ensure that your shoes and bags keep their shape by stuffing them with crumpled newspaper after each use. By no means is this intended for you to start fires wherever you’d like. That’s called arson — and it’s illegal. If you’re going camping or starting a fire in a fireplace, however, it’s always good to have some newspaper on hand to give the fire an extra boost in case you can’t find kindling or the wood is a little damp. Place newspaper under pantry items like potatoes and onions to keep the moisture — and bugs — away. 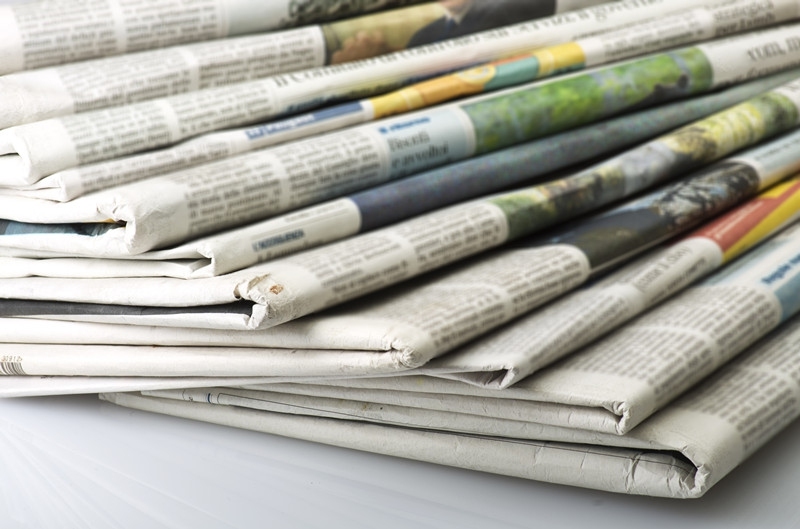 Newspaper can be used to line other shelves in your pantry as well; if you spill something, just remove the paper and toss it out or recycle it. Newspaper shreds are an excellent alternative to the very non-eco-friendly “grass” with which we line our Easter baskets. The shreds can be used as filling for other baskets as well. For example, if you’re gifting a food-themed basket, fill the bottom with strips from the circulars or cooking section. When I was a kid, my parents wouldn’t spring for store-bought book covers when newspaper worked just as well. I probably hated it back then, but now it seems kind of cool. To tell the books apart once they’re covered, use a section of the newspaper that represents each book. For instance, if you’re covering a science textbook, pick the tech section of the paper. Follow these easy instructions to make a newspaper book cover. When I’m from (Hello, Baltimore! ), it’s a summertime ritual to buy (or catch) a bushel of crabs, steam them up, and dump the red devils on a newspaper-lined patio or porch table. If you’ve ever picked and eaten crabs before, you know how messy they can be (which is why I don’t do it; sorry, Baltimore). The newspaper serves a dual purpose for messy outdoor eating: a) it keeps your table clean, and b) it makes clean up a breeze because all you have to do is fold up the paper starting from the edges and dump it in the trash. Bubble wrap and other paper packing supplies are expensive. Honestly, I don’t know why people purchase these things when there are probably plenty of materials lying around their own homes that will suffice in sending the package safely. Newspaper is lighter than bubble wrap too, which will reduce the shipping fees. To pack a box with loose or fragile contents, first wrap the items individually (if they’re breakable, then stuff the open space with crumpled up paper. Just make sure that everything is tight so there’s no opportunity for movement during transit.